Starting over as an immigrant who doesn’t speak English in a new country, and ending a relationship with the person who’s her only support system was hard for NE student Carolina Pereira. She had to figure out how to make a way when there wasn’t one. The Venezuelan-born journalist has known she wanted a career in front of the camera since she was a child. Pereira’s passion for communication took her to the Universidad Santa Maria in Venezuela to study journalism. One year into her studies, she landed an internship at the local news station, Globovison, and then transferred to the Universidad Central de Venezuela to study announcing. It was perfect timing for Pereira — she was learning the fundamentals of journalism in school and receiving job training at Globovision, which she compared to CNN because the station focused on news first and foremost. 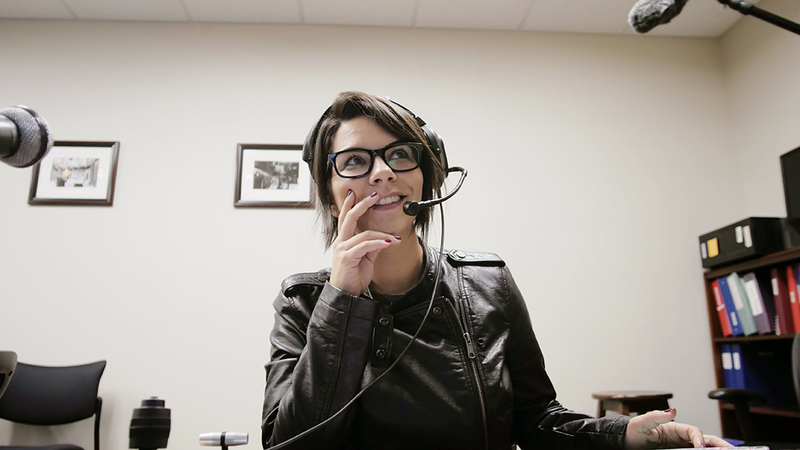 Carolina Pereira sits behind the switcher as the technical director during an exercise for her TV studio production class on NE Campus. 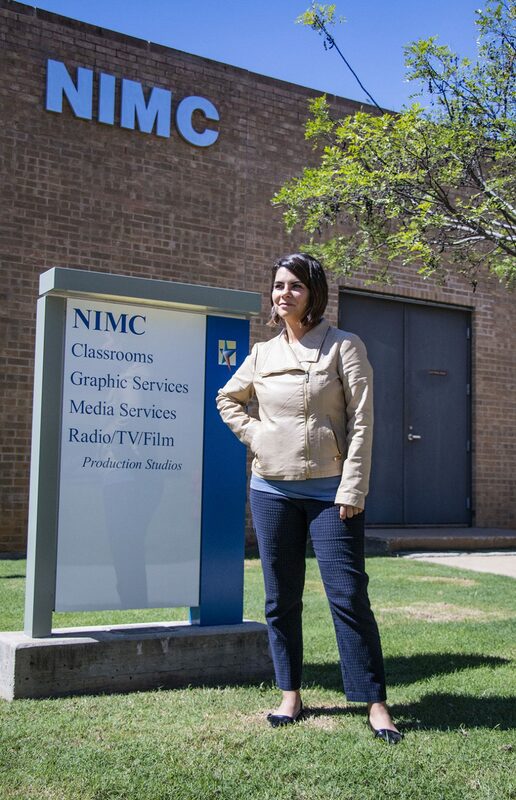 She’s taking the class to complete her associate degree in radio/TV/film. During her time at the station, she interviewed many political figures and stars in Venezuela, but two of those interviews will forever stand out to her. One was the late Argentine journalist Ernesto Sabato because of his influence on South American journalism, and the other was the late Venezuelan President Hugo Chavez. Pereira said Venezuela during those years was not an easy place for journalists to criticize the government. Oil has made Venezuela the richest country in South America, yet it has an 85 percent poverty rate. Pereira finds that disturbing but feels like socialism among other things is affecting the quality of life in the country. Pereira had a plan, but like most plans, hers didn’t unfold the way she envisioned it. She quit her job to leave Venezuela with her boyfriend and come to America for a year to learn English. 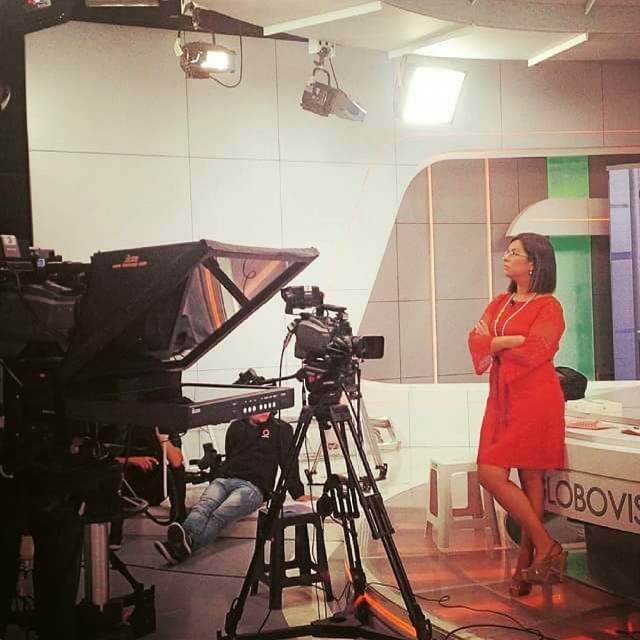 Pereira prepares to broadcast at Globovision, the television network she worked at in Venezuela before coming to the United States. “I was in a relationship with my ex-boyfriend for four years, and we decided to do an English-intensive learning program here in America,” she said. After four months of being in America, Pereira said her relationship ended, and she was on her own. “I was here in this country, an immigrant with an initial plan, now alone with nothing,” she said. She continued her English studies at Texas Christian University and used that program to enroll in the radio/TV/film program on NE Campus. Radio/TV/film program coordinator Brandt Sleeper, who had Pereira as a student in his Radio/Television News class, said he was impressed with her. “She’s very dynamic, professional, and she brings an international dynamic, which is great for the other students to see because she’s been in the industry for a period of time in her country,” Sleeper said. And TV instructional specialist Darryl Hoelting said she has an impressive work ethic. “I do commend her for coming to TCC and wanting to further her knowledge and education in the radio/TV/film industry,” he said. Pereira believes she’s achieving her dreams even though that’s not why she initially came to this country. She believes if people can achieve their goal once, then they can achieve it again. “As an immigrant, you can do it even though you might be in a hard place and facing hard times,” she said. She wants immigrants to know that she’s an example. By focusing on their goals, craft and by networking with people, anyone can make it. “The American Dream is here,” she said.